This is the Main user interface of the TemplateToaster software from where you can start designing your new theme/template. File menu contains a list of various commands to perform different functions like creating a new project, saving the project, opening project, exporting the project and much more. For details, please refer the File Menu section. QAT displays a list of frequent actions performed by the user: Undo, Redo, Save, Open file, Preview, Export. Please refer the Quick Access Toolbar Section for detailed explanation of these options. This tab contains options for designing the body of the theme/template or website. You can choose background, texture, and effect, type of background i.e fixed/scroll and you can also customize the scroll up button for the template body from Body Tab section. This tab displays various options for deciding the background, layout, and effects for the page. For further elaboration, please refer Container Tab section. This tab includes options for designing the header which includes header position, background, layout, effects, foreground images, text areas, title, and slogan. It also contains settings for configuring the logo and social media icons. For details, please refer Header Tab section. It displays options to design the menu. Such as some preset styles, menu position, background, layout, effects, logo, foreground image, text areas, menu button designing, submenu designing and edit menu. These all options are elaborated in Menu Tab section. Side Tab has options for designing the sidebars, such as sidebar position, background, layout, effects, height. Please refer Sidebar Menu for details. 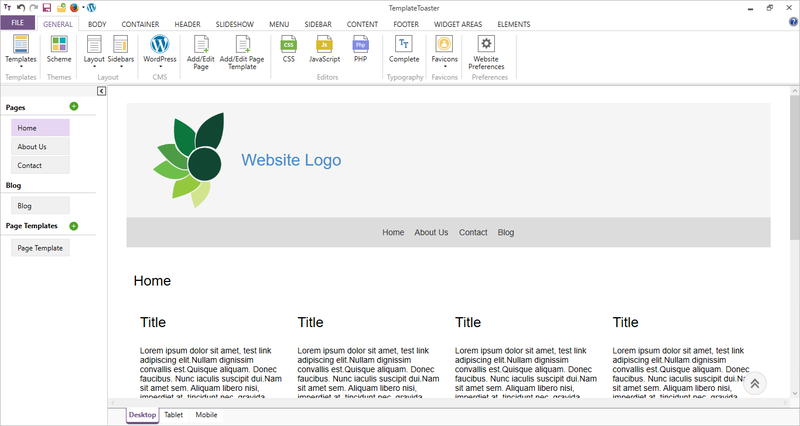 It Includes all the options for designing the content part of the template/website. It has some preset styles for content, various options to set content properties, background, typography, texture, effects, shadow, lists, and table. Offers similar options for designing the posts and the comment form and the comments. Even, you can export a theme with no or dummy content and add new content later from the WordPress dashboard. For further details, refer Content Tab section. This tab has options for designing the footer part of template or website. It has preset styles of the footer, options for layout and background designing, choosing a texture, effects, and shadow, browsing custom images to add in the footer, drawing text area, choosing footer typography and social media configuration settings. For more details, see Footer Tab section. This tab gets active when you select WooCommerce, WordPress, Magento, Joomla, Opencart. Module Position Tab will appear in place of Widgets Tab If you choose Joomla. Block Reference Tab will appear if you choose Magento or OpenCart. It has features to design the widgets/Module/Block, like container properties, container background, header properties, header background, texture, effects, shadow, border, height, typography, content properties and content background. Let’s move to Widget Areas Tab to know more about it. Element tab contains options for designing the BOOTSTRAP based elements like Buttons, Input field, Pagination, BreadCrumb, Block Quote, Label, Alert, Badges, Line, CheckBox, and Radio Button. Please refer Elements Tab Section for details. It includes all options for creating a slideshow such as a slideshow position, transition effects, button, pagination, background, layout settings, effects (texture, effects, shadow), foreground images, text area and logo browsing. If you want to remove the slideshow from your theme/template/website then just uncheck the checkbox. You can get further information in Slideshow Tab.